(Honey Rose Mountain Sage) So dark that they almost seem black, the stems of this Mountain Sage add drama to flowers the color of creamy tomato soup. The lush, mid-green foliage has distinctive ribbing and is stiffly upright; it makes a strong statement when grouped with soft, rounded Salvias. Honey Rose has long been grown in Southern California due to its heat and drought resistance. Mountain Sages are habituated to dry conditions in their native lands of the Southwest and Mexico. Honey Rose isn't picky about the fertility or loaminess of its soil, but needs good drainage. 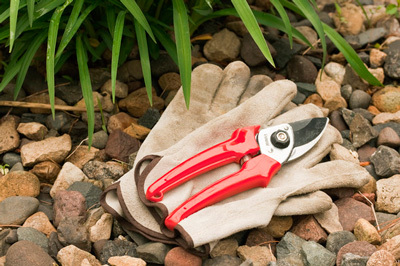 Grow it in full sun to partial shade. It does well in a dry garden but is equally comfortable with regular watering. At 4 feet tall and 2 feet wide, this bushy sage is a good addition to the landscape as a border, edging for a pathway, a screen or background planting. Honey Rose also does well in containers. Honeybees and hummingbirds enjoy it. 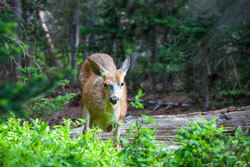 However, as with most sages, deer just say no. 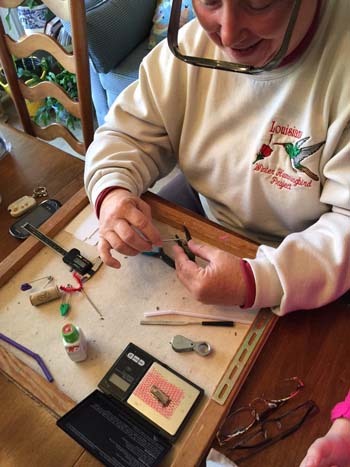 Renowned hummingbird bander Nancy Newfield of southern Louisiana shares her journey from 1970s stay-at-home mom to citizen scientist and one of the nation's leading hummingbird researchers. 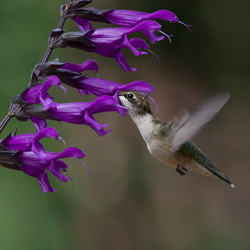 This is the first article in a three-part series about Newfield's work and gardens, which abound with Salvias to feed hungry hummingbirds that overwinter in her suburban yard near New Orleans. It includes plant lists and the Louisiana Winter Hummingbird Project tally of banded hummingbirds from 1979 to 2015. 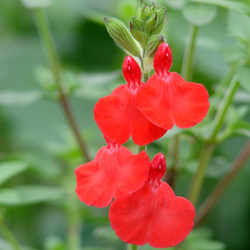 (Elk Cranberry Red Sage) With larger-than-expected deep red flowers and dark stems, this outstanding new variety from FBTS is without a doubt a "Best of Breed" plant. The plants are so beautiful: large, healthy and just ready to grow and bloom. These are among the best salvias I have ever received. The selection of plants is fantastic too. My first order, but it certainly won't be the last!